(Houston, Texas - Tuesday, May 13, 2014) - Sam Houston Race Park announced that Kiss My Hocks, a two-year-old colt owned by Conda Maze and Tyler Graham, was named 2014 Horse of the Meet. The talented juvenile set a new track record in his career debut here and followed that with a victory in the richest race of the 2014 American Quarter Horse season, the $563,950 Sam Houston Futurity (G2). The son of Tempting Dash out of the Tres Seis mare Romancing Mary was bred in Texas by Tyler Graham and John Mayers. Trainer Toby Keeton had the colt in fine form on March 29 when he won his 330-yard trial in a time of :16.433, and broke a track record of :16:514 seconds set on July 5, 2002 by Pies Power Play. Maze accepted the trophy on Sunday, thanking Keeton and his crew for their exceptional care of Kiss My Hocks. "Toby, Cindi (Keeton) and all the boys on the backside have done a tremendous job," said Maze. "We thank Sam Houston Race Park for this honor and for having such a kind racing surface." "He is the soundest two-year-old I have ever seen," added Graham. "He's a big colt, but very light on his feet. He's training now for the Ruidoso Futurity and if all goes well, we hope he will qualify for the All American (Futurity) as well." 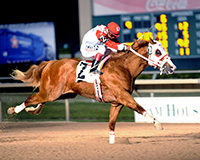 In addition to being honored by Sam Houston Race Park, Kiss My Hocks has earned national recognition as the top ranked two-year-old in the AQHA Racing-Horseplayernow.com Poll. Sam Houston Race Park officials were pleased with handle and attendance numbers for the 24-day Quarter Horse meet, which began on March 21. Total daily handle was up 9%, with an increase of 1% on daily live handle. Daily export handle up 12%. Increases were noted on both Friday and Saturday evenings, with total handle up 27% on Friday evening and patrons wagering on racetracks across the country up 38%. An increase of 8% on total handle was also noted on Saturday evenings. Sam Houston Race Park reported increases in attendance and handle for its simulcast of the 140th Kentucky Derby coupled with live racing on Saturday, May 3. A total of 12,102 racing fans were in attendance compared to 11,023 in 2013. In addition to the almost 10% increase in attendance, officials noted a 7.5% boost in all handle for live racing, and the Churchill Downs card including the Kentucky Derby. "We are thrilled to have another great racing season under our belts," said Sam Houston Race Park president, AndrÃ©a Young. "The gains we experienced during the Quarter Horse meet are a testament to our great fans and great horsemen." Angel Sanchez earned the Trainer of the Meet title, the first ever for the Texas horseman who has been training for seven years. Sanchez won 18 of his 68 starts to surpass six-time leading trainer, Judd Kearl, who saddled 14 winners; Trey Wood, whose runners won 12 races this meet and Bobby Touchet, whose horses made nine trips to the winner's circle. While Sanchez did not have a stakes winner this season, he trained Cartel Arrangement, the fastest qualifier for the $167,300 Sam Houston Derby (G3). "I am thrilled to have won my first title," said Sanchez. "I want to thank my wife and children. I am grateful for the support of my owners, especially J. B. and Sherrie Morace, who have been with me since I began training." Sanchez, who resides in Stockdale, Texas, will ship his runners to Retama Park for their 2014 Quarter Horse meet, which gets underway on June 6. For the third year in a row, jockey Luis Vivanco has topped the rider standings at Sam Houston Race Park. He was dominant throughout the 2014 meet, finishing with 30 wins, 18 seconds and 21 third-place finishes. The 31-year-old jockey was born in Vera Cruz, Mexico and has been one of the top riders in Texas, winning three titles at Retama Park and finishing second at Lone Star Park. His most notable stakes win this meet was aboard Kiss My Hocks in the $563,950 Sam Houston Futurity, the richest race of the season. "First, I want to thank God and my family," said Vivanco. "I also want to thank all the trainers that gave me great horses, especially Toby Keeton, Abel Morin, Jesse Yoakum, Mauricio Lopez and Bobby Touchet." Vivanco is also planning on returning to Retama Park for their Quarter Horse season, and hopeful he will also have a chance to make his first start at Ruidoso Downs. Ricardo Aguirre, who finished fourth in the 2013 jockey race, had an excellent meet, riding 22 winners to notch second place in the standings. Francisco Calderon was third with 19 winners and Santos Carrizales was a close fourth with 18 victories. The race for Owner of the Meet went to the wire on the final day of the meet and ended in a three-way tie between Texas horseman A. D. Maddox, John Boegner and Pete Scarmardo. Each won five races. This was the fifth title for Maddox, whose horses are trained by James Gerhards. Boegner owns and trains his runners and Scarmardo had success with Guy Hopkins and Leon Bard, who conditioned Raising Kain, the winner in of the $58,860 Adequan Texas Derby Challenge on the final day of the meet. Live Thoroughbred racing will return to Sam Houston Race Park on Friday, January 16, 2015. Until then, a comprehensive menu of simulcast racing will be offered seven days a week. Sam Houston Race Park will simulcast the Preakness Stakes on Saturday, May 17 as well as the third leg of racing's Triple Crown, the Belmont Stakes on Saturday, June 7. Premier race meets including Monmouth Park, Saratoga and Del Mar will showcase top Thoroughbreds this summer and Quarter Horse fans will be able to watch and wager on "America's fastest athletes" at Ruidoso Downs, beginning May 22.